The House of MBj, one of India’s pre-eminent fine jewellery luxury brand, known for its handcrafted and designer polki and diamond jewellery collaborated with one of the best Indian style brand known for minimalist resort wear, Wendell Rodricksat the AW 2018. 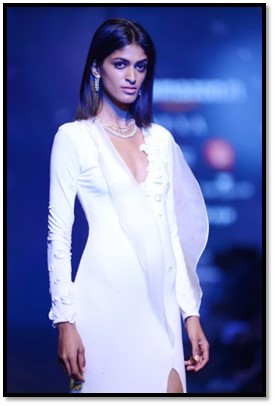 Schulen Fernandes for Wendell Rodricks presented The White Carpet Collection for Liva Fluid Fashion along with the studded handcrafted jewellery by The House of MBJ. The models on the stage looked ravishing while walking the ramp to a full house audience. Both the luxury brands came together to put out a spectacular show towards the end of 3rd day of the AW 2018. Managing director Gautam Soni (The House of MBj) said, “Schulen Fernandes for Wendell Rodricks has been one of the best association for us so far. Collaborating with a brand that believes in minimalism, we couldn’t have asked for more. The white carpet collection was mesmerizing and indeed our diamond jewellery had seamlessly complemented the garments. The audience seemed to have loved the show tonight and we look forward to associating with Schulen again and bring out the best of both luxury brands." Commenting on the collaboration Director, Schulen Fernandes said "Our association with The House of MBj for the AIFW AW 2018, is perfect. Both brands are synonymous with luxury, refined elegance and a design legacy with the highest quality as its core values. So it made absolute sense to collaborate for the Schulen Fernandes for Wendell Rodricks 'White Carpet Collection'. This collection is a first from the WR design house, unveiling a stunning new line of resort bridal wear ideal for weddings by the sea. At the heart of the collection is mystique and subtle glamour. Light, fluid, sensual and high on couture workmanship, the 'White Carpet Collection' celebrates minimal restraint to sequinned sparkle with encrusted floral details. The diamond jewellery from The House of MBj brand are specially curated exquisite pieces using the choicest diamond set with utmost precision in a unique fashion to create extraordinary necklaces, earrings and rings that define beauty and timeless elegance." This specially curated show was a tribute to a sensual natural fabric and an ode to the Indian feminine beauty where the concept of “Shringar” extends to a clothing that heightens the essence of the Indian beauty.